Wheels: Pneumatic 13" x 5"
Our top-of-the-line, walk-behind rototiller gives you the convenience of dual tine rotation, allowing you to easily switch between forward and counter tine rotation. For tilling or cultivating in established gardens, go with forward rotation. Switch to counter-rotation for sod-busting or loosening of compacted soil. Either way, the self-propelled, tractor-style wheels pull the PRO XL along, making the job easy on you! The ability to switch between forward- and counter-rotation lets you choose the right mode for the job at hand. The simple lever adjustment is right at your fingertips. The tractor-style pneumatic tires propel the tiller forward easily in almost any terrain. When you want to free-wheel, you can simply switch into neutral gear. The PRO XL-DRT uses an easy-starting, 208cc Overhead Valve engine with 9.5 ft-lbs of gross torque. It features a debris management system that protects the engine from whatever you kick up while tilling your garden. Warranted for 2 years (90 days in commercial use). The tiller works good. Only issue was paint damage in shipping from handle moving around. I have been using a smaller rear tine tiller for years but at 82 years old it was beating me up. This DR tiller will keep me gardening for many more years as it operates easily. Was a snap to assemble and this machine starts on the first pull. I highly recommend anyone considering a new tiller to look at this PRO XLDRT before you buy. Biggest plus, ease of operation. After getting used to the controls, it performed perfectly. Very easy to use, tills deep as you need and runs smoothly. Well built, heavy duty machine. It worked great in my garden even with the rocky soil. I am 77 years old I got the pro xl Drt put oil and gas in started first pull. But the handle or to low I am 6'3 tall. I thank it a good tiller I just used one time. Works Great does a great Job. Added the oil, added gas, choke, pulled the cord and it started first time. This is why I trust my outdoor equipment to DR. Did a great job at tilling up a first time garden. So far it has been a great tiller for the money. Previous tiller was a Troybilt pony and while it seems like a more sturdy and better built machine, it is way more expensive than the xl drt. I am pleased with the purchase. Wish the diagram of the tiller in the instruction set up guide was a little more detailed and model specific. Will find out soon when nice day weather to tiller garden & then will know how it are & let you know after this later! thanks!---We like this Dr Rear Tine Rototiller! Works as described. Ground has been to wet to use alot. Tried it out when we unloaded it and assembled. Worked great. Easy set up add fuel and oil turn fuel on set 1/4 choke easy pull cord start a couple pulls first time after that first time pull start. Small roots no problem on grassy areas a little bounce nothing major at a tilt it will stall i think it's built into this unit and the back plate is great for leveling uneven areas out simply put in reverse and let it do the work i would recommend the product to friends and family with no hesitation great product and good quality! It is always a pleasure to receive a piece of equipment that works exactly as advertised. We have a small piece of property, but my wife likes to plant flowers and maintain or move gardens. Since we are in our 70's we have become more prone to put this kind of work on hold, until we received this tiller. it is reasonably easy to maneuver note though that it's over 200 lbs out of the box, and we have begun to do work with it that we have put off for years. Along with the DR Trimmer we purchased, they make retired life a lot more pleasurable. Great Briggs and Stratton engine. And it has a reasonably small footprint in the garage. This tiller is a great piece of machinery. It plowed through roots, rocks, and really hard compacted soil at half throttle. My tiller showed up crated very well and was assembled , oiled, gased, and ready to work in 20 minutes. Can't say enough about the Briggs and Stratton motor, first pull, monster torque. It still looks like brand new after a quick hose down. The powder coating is second to none. I used Castrol HD oil and VP canned 94 octane fuel. Couldn't be more satisfied, great job DR.
Had to wait a long time to receive. Already had garden planted when it finally arrive, but used it on a small addition to garden in new soil. The rear rotation really tore up the new ground with grass roots. So far I am very happy with its ability to turn new sod into a fine tilled garden area. Thanks! Does all the work with very little exertion from me. Exactly what I wanted and expected. My friends are soooooo jealous! Easy to assemble anspd even easier to use. I was impressed at how well it busted through sod that had never been tilled. I also like the self propelled feature..
Good tiller. Easy to assemble. Adjustable handle lever had threads that were stripped and would not screw onto the nut. Other than my rocky soil, it seems to be working fine. Plus: Tillers easy to start does a great job on hard packed soil as well as recently tilled soil. Minus: The handle is too low for someone of average height. The drag bar, for use when operating the tines in the forward mode, tends to become stuck and can only be moved by driving it up with a hammer. I bought the PRO XL-DRT to put in a new garden of around 6,000 sq. ft. Last year I used my DR walk behind brush cutter the clear sage brush and small trees from the garden site. Got the tiller home and uncrated. It was easy to assemble. I put in oil and gas, and it started on the first pull. This tiller was a little small since I just cleared the ground last year and there were a lot roots and small stumps to go through. After this initial tilling I think this tiller will work out just fine. After about 15 minutes of use a couple bolts on one of the side guards fell out and the guard got damaged by the rotating tines. To me it would be helpful if this tiller had a larger gas tank. Even though manufacturers don't like to state the horse power rating on their small engines anymore, the HP seemed adequate on this tiller. I was a littler disappointed to find that this machine was made in China. I didn't see the country of origin anywhere on the DR website prior to ordering. Over all I'm happy with my purchase of this tiller and would recommend this product. Just check the tightness on all bolts prior to use, and again after using. This was my first choice after researching several rear tine tillers. I ran it no more than 20 minutes only to find the transport mode reverse did not work. It also creeps along in neutral. So far it's remains in the shop warranty for almost 2 weeks while I have been missing all my tilling/planting dates. You can imagine, I am disappointed and unhappy. This is not a good start for a first time DR customer. This is an Excellent! Tiller! I bought this for my husband as a gift and he loves it! He likes the fact that the fines go forward and backwards. All in all it’s an Excellent! Machine! So far this is working out to be a fine machine. I have used it twice already and looking forward to using it again very soon. Only time will tell how that holds up, but I see no reason it should not last. It seems to be well built. It is easy to use after the minor assembly that was required. JUST read the manual!! One minor issue. Within the first hour the pin holding the shift lever bracket sheared off in the shaft. I called customer service and the gave me the okay to fix it myself. I bought a cotter key and replaced the broken pin and have not had any further issues. Only about 2 hours of use at this point but I do like this tiller. Just tried the tiller today. Ground was real wet but tiller went right thru it. For being wet soil tiller didn't seem to ball up much underneath. you do have to watch the depth stake when adjusting it or it will fall out. would be nice if you had some type of row marker to go with it. Cannot rototill in rough ground as front is low and cannot climb a mound of earth. Front end tiller can knock off a mound. However rear tine tillers are best over all as no one has to hold the machine on course. Does a marvelous job of breaking up the soil and leaves it ready to plant. The machine starts with one pull and even though it is winter I did use it to break sod, it worked well. The only downside for me is that the throttle cable and mechanism could have a better design. The cable sheathing tends to move in and out when accelerating and decelerating. Typically the sheathing is captured in the mechanism and only the cable moves. When the throttle is in the stop position the engine continues to run. The spring that activates the off handle is too weak and the machine has to be turned off by hand. Lastly, the oil fill hole on the engine is on an odd angle and buried underneath the block. This could be redesigned to look like the old Briggs engines so that the fill hole is vertical and out from under the engine. Further, the oil drain hole is on top of the tiller frame so that when draining the crankcase, oil spills and drips onto the frame of the tiller. I recommend you do not change the oil on your garage floor because it can be messy. It has been way more than I expected. Works great. built great. can not wait to use it. This Tiller is a true workhorse. It works great for bot forward tine tilling and rear tine tilling. Instead of having one machine for each, you have one for both. With the single lever to change tilling directions, you only have to stop for a second to change directions. Convenient and fully functional. The DRT Tiller does exactly what you'd expect. If you have really hard, tough soil the CRT option is perfect, it digs in and doesn't let go. If a less aggressive till is needed, the FRT option is what you'd need and does it without a problem. It's convenient to have the two options in one machine. The DRT tiller is perfect for my garden. My soil has a high clay content and tilling the first time in spring is rough because the soil is like cement. With the DRT all I have to do is engage the tines so they counter rotate and they dig right in. After that initial tilling I put the tines in the STD position and tilling is a snap. It's great to have both options in one machine. Q.Is there a neutral position? Reverse? A.Thank you for contacting us. There is a neutral position that allows you to wheel the tiller if you like. There's also a reverse gear, making it easy to back up when you need to change position. Please feel free to contact us if you have any other questions. Q.Does this ship assemble? If not, what is involved in setting it up? A.The DRT Tiller will need some assembly when you receive it. You will need to install the lever, bar, handlebar assembly, and the depth stakes. You will also need to add gas and oil before using. The total time for assembly is 30-45 minutes. Please feel free to contact us if you have any questions. 128 people found this answer helpful. Q.How much does this weigh? A.Thank you for contacting us regarding the Pro-XL Dual Rotating Walk-Behind Tiller. It weighs 206lbs with a shipping weight of 236lbs, Please let us know if you have any other questions. 96 people found this answer helpful. Q.How do I adjust between STD rotating and CRT? A.Thank you for your question regarding the Pro-XL Dual Rotating Walk-behind Tiller. There is a lever on the handlebars that control the tine rotation. By chaning this, you can easily switch between the two rotation options, it even allows for a transport mode. Please feel free to contact us if you have any other questions. 93 people found this answer helpful. 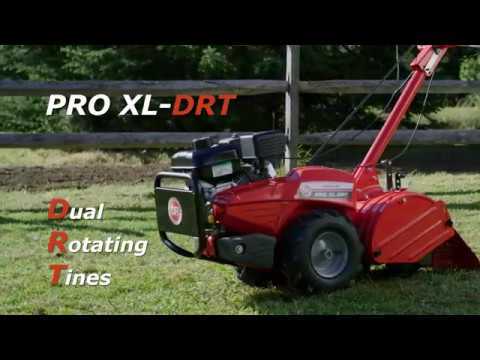 Q.Does the DR Pro XL-DRT-Dual Rotating tiller have electric start? A.Thank you for your interest in the DR Dual Rotating Rear Tine Rototiller. This unit is only available with the Manual-Starting engine. Please feel free to contact us if you have any other questions. 67 people found this answer helpful. Q.Are the rear tines chain driven or is there also a gear box driven by the chain? A.Thank you for contacting us. There isn't a gearbox on the DRT. The transmission is driven by the engine via a belt but the transmission is all cogs/sprockets connected by a chain on the inside. Please feel free to contact us if you have any other questions. Q.Are there any attachments for this tiller, such as a hiller furrower? A.Thank you for your question. There are not any attachments available for the Dual Rotating Tiller. Feel free to contact us if you have any other questions. Q.What is the fuel capacity? A.Thank you for your question. The Dual Rotating Walk-Behind Till has a fuel capacity of 96 oz (3qrts). Please feel free to contact us if you have any other questions.